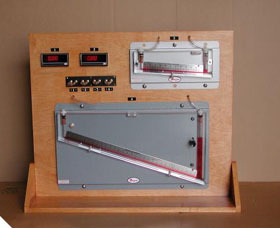 Manometer Panels Manometer panels are available with inclined manometers, digital manometers, or a combination of both. The standard inclined manometer panel has four inclined manometers with pressure ranges of 0-0.25, 0-1.0, 0-4.0, and 0-6.0 inches w.g..
Digital Panels The digital manometer panel has two digital manometers with a range of 0-5.0 inches of w.g.. The power input for the digial panel is 115VAC, 1ph. Other ranges are available upon request. 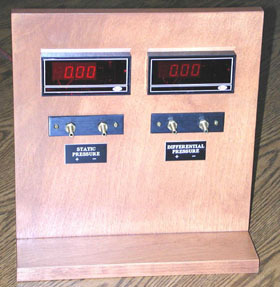 Custom Panels Custom manometer panels are available with a combination of both digital and inclined manometers. Contact us with your requirements and we will determine feasibility. 150 CFM Chamber The 150 CFM chamber is 12 inches in diameter and 36 inches in length. The standard flow range is 3 to 150 CFM. The nozzle array is accessible through a removable panel for nozzle selection. 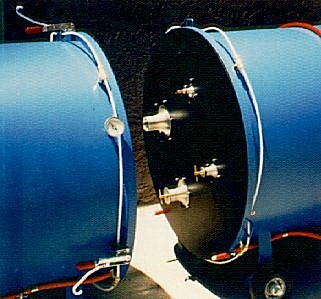 The counter blower is mounted on the end of the chamber and uses a universal motor/variable transformer for speed control. This design does not utilize a blast gate and is typically used to determine system resistance and volume flow through power supplies and smaller electronic assemblies. 500 CFM Chamber The 500 CFM chamber is 16 inches in diameter and 48 inches in length. The standard flow range is 3 to approximately 500 CFM. The end plates are sealed with gaskets and the flow is reversed by interchanging the end plates. The nozzle array is accessible through a removable panel for nozzle selection. The manual blast gate is on one end with a flexible duct connecting the counter blower to the chamber. The counter blower has a 1 horsepower motor and the speed is varied with a solid state speed controller. The power input to the speed controller is 115VAC, 50/60 Hz. Other power inputs are available upon request. 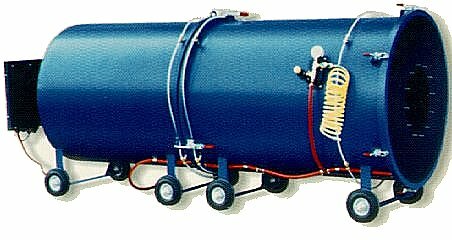 1200 CFM Chamber The 1200 CFM chamber is a scaled up version of the 500 CFM chamber and is 24 inches in diameter and 5.5 feet in length. The standard flow range is 3 to approximately 1,200 CFM. The end plates are sealed with gaskets and interchanging the endplates reverses the flow. The nozzle array is accessible through the cover plate on the chamber. The standard blast gate is manual and motorized blast gates are available. The counter blower is 3 horsepower and power input to the speed controller is 208VAC, 1ph or 3ph, 50/60 Hz. 2000 CFM Chamber The 2000 CFM chamber is 30 inches in diameter and approximately 8 feet in length. The standard flow range is from 3 to 2000 CFM. The nozzle array is on a separate plate and is sealed between the front and aft section with inflatable seals. The front plate is also sealed with an inflatable seal. The motorized blast gate is powered with 115VAC, 1 ph, 60Hz and is controlled with a hand operated toggle switch. Limit switches control the extreme ends of the travel to prevent overrun of the gate. The counter blower is connected to the blast gate with a flexible duct. The 2000CFM chamber has a 5 horsepower motor and solid state speed controller. The power input is 208VAC, 3 ph, 50/60Hz. 3000-5000 CFM Chamber The 3000-5000 CFM chambers are similar to the 2000 CFM chamber. The 3000 CFM chamber is 36 inches in diameter and approximately 10 feet in length and has a 10 horsepower counter blower and solid state speed controller. 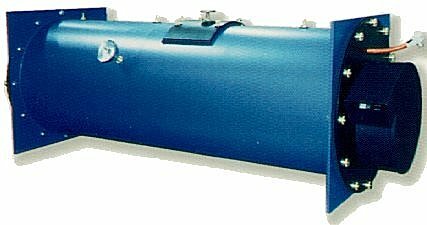 The 5000 CFM chamber is 48 inches in diameter and approximately 12 feet in length and has a 25 horsepower counter blower and solid state speed controller.